There are so many worldly influences telling women how to act, what to wear, who to be seen with, where to be seen, etc. I thought it would be a good idea to spend my Bible study time today looking at what God’s word says. I’ll be using the International English Bible and following up on the footnotes and scripture references provided there. (f) literally, “Who can find a fine wife?” Hebrew: ‘eshet chayil = a woman of force (= character). See Proverbs 12:4 below. Each of the last 22 verses of Prov. 31:10-31 begins with a different Hebrew letter and it is in Hebrew alphabetical order. This is called the acrostic style. (g) or “jewels.” Compare Prov. 3:15; 8:11, 35; 12:4; 18:22; 19:14; 20:15. Proverbs 8:11 (IEB) says: “Wisdom is more valuable than rubies. Nothing that you desire is equal to it. Proverbs 18:22 (IEB) says: “A man who finds a good wife finds something good. He obtains favor from the Always-Present One. I leave my study today after one verse, Proverbs 31:10, but with a much clearer vision of what an “excellent wife” is; a woman of character, who is knowledgeable, wise, and prudent. She is described as being like a crown for her husband. And lest I forget; a good wife is a gift to her husband from God. The world would tell me “you are just a wife.” But God designed me to be a gift of great value to my husband. It’s up to me to choose whose judgment I accept, and whose word I’ll follow. I have a choice to be a curse or a blessing to my marriage. In Joshua 2 Rahab told the King’s messengers that Joshua’s spies had left. Verse 6 tells us ‘But the woman had taken the men up to the roof and hidden them there under stalks of flax. She had spread the flax on the (flat) roof to dry.’ Isaiah 19 tells of God’s Judgment against Egypt. Egypt was famous for this excellent cloth which was hand made from flax. God says the waters of the Nile will become dry. In verse 9 it says “All the people will be so sad. Those who weave fine linen will lose hope (because a lot of water is needed to process the flax.) Those who weave cloth will be broken. All the working men will be grieving”. In Jeremiah 13:1 God tells Jeremiah “Go and buy a linen belt for yourself.” The footnotes for this verse indicate linen was originally symbolic of holiness (Ezek. 44:17-18). So when verse 13 says she looks for wool and linen – she is looking for the most treasured materials to make cloth for his household. (i) her shopping trips were not limited to her own immediate neighborhood. She was familiar with goods that came from the Mediterranean coast. She was always looking for bargains. The world would tell me “Happy wife, happy life” meaning the husband should give the wife what ever she wants. What a shallow relationship! This thinking keeps the husband in a constant position of having to provide the next “thing” to keep her happy, and keeps the wife perpetually in the position of a spoiled child, rather than a treasured mate. The picture that is painted here in Proverbs 31 is of a woman who is focused on doing her best for her husband. Her goal is to bring honor to him, and in turn she will be treasured by him. That is a much fuller relationship! It’s the kind of love God wants for each of us. I leave my study today looking for ways to bring honor to my husband. Gen. 22:3 (IEB): when Abraham was tested he got up early, and prepared to do as God had asked. Psalms 57:8 (IEB): David writes that he will sing and make melody to God; “I will wake up the dawn”. Joshua 3:1 (IEB): Joshua left early in the morning to travel to the Jordan where they would cross with God’s help. Joshua 6:2 (IEB): God told Joshua that he had given Jericho to him and gave him instructions to follow. Joshua followed these instructions to the letter. In 6:12 it says they got up early the next morning and did it again then went back to camp. They did this for 6 days. Joshua 6:15 “On the seventh day, they arose at dawn” and followed God’s command. The walls collapsed and the Israelites seized Jericho. Proverbs 20:13 (IEB): “If you love to sleep too much, then you will be poor. The world would tell me my worth is measured by the money I make, but God values my obedience and willingness to serve. I leave my study today determined to make the most of each day. While I don’t have any servant girls, I can organize my time, see to the needs of my family, and be productive. Proverbs 24:30-31 (IEB): “I pass by a lazy person’s field. (g) I went by the vineyard of a man who had no sense. And behold, thorns had grown up everywhere (Willful neglect). The ground was covered with weeds. And the stone walls had fallen down. Clearly, a husband is blessed if his wife has good business sense and is industrious. There is nothing wrong with earning her own money and reinvesting it. A lazy wife however is wasting the blessing God has given her, and is willfully neglecting her duty. I leave my study today looking for ways to be a blessing to my husband. (c) literally, “Poor (is) the one who is working (with) a slothful hand.” the Hebrew word for “hand” here is Kaph. It is the open, ineffective palm. (d) literally, “But the hand of the diligent makes (one) rich.” The Hebrew word for “hand” here is yad. It means a tense hand that is braced for vigorous work. Contrast the lazy worker all from yesterday’s lesson: Proverbs 6:6-8 (IEB), Proverbs 12:11 (IEB), Proverbs 12:24 (IEB), Proverbs 12:27 (IEB), Proverbs 13:4 (IEB), Proverbs 14:23 (IEB), Proverbs 18:9 (IEB), with the hard worker in Prov. 27:23-27; 28:19. Proverbs 27:23-27 (IEB): “Be sure you know how your sheep are doing. Pay close attention to the condition of your cattle (literally – “Set your heart to the herds.” diligence prevents losses.). Riches will not last forever. Governments will not continue forever, either. When one brings in the hay, and the new grass appears, and the plants from the hills are gathered, the lambs will provide your clothing. And, the price from some male goats will buy a field. There will be plenty of goat’s milk for food to feed you and your family. And, it will nourish your servant girls. A worthy woman is a hard worker. She doesn’t sit around waiting to be told what to do. She sees what needs to be done, and takes action. I leave my study today with renewed determination and energy, ready to take action. (a) “literally, “Her lamp does not go our at night” = She puts in long, hard hours. (b) “She was sympathetic, tender, and charitable. Compare Prov. 14:21; 19:17; 22:9. Proverbs 19:17 (IEB): “Being kind to the poor people is like lending to the Always-Present One. He will reward you for what you have done. Acts 9:36 (IEB): “In the town of Joppa, there was a follower of Jesus named Tabitha, (Her Greek name; Dorcas, means ‘a deer’). She always did good things for people. She always gave to people in need.” When she died, her friends sent for Peter who was in a nearby town. All of the widows cried and showed Peter the garments that Tabitha had made for them while she was alive. 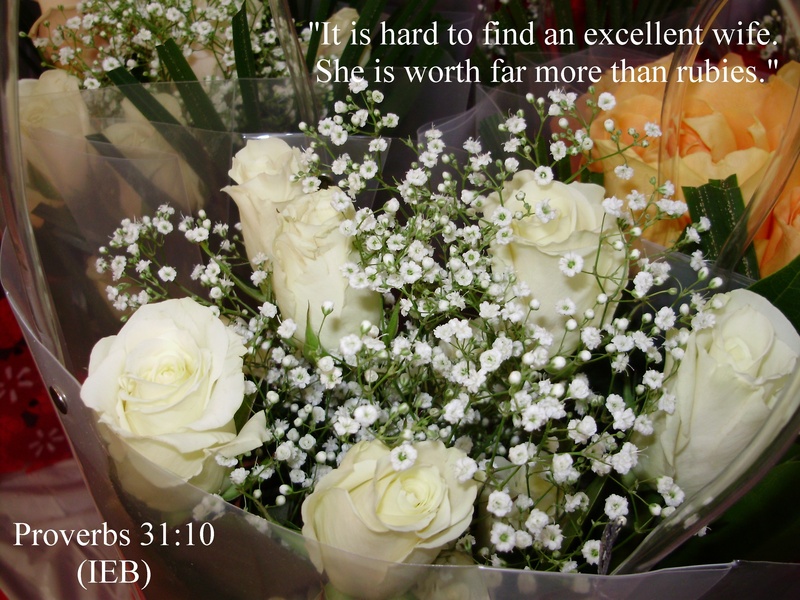 Clearly a worthy woman is diligent and hard working, sympathetic, tender, and charitable. I leave my study today with a better understanding of what it means to be charitable, and who I am really serving. It’s also clear that with every command, there is blessing if I am obedient. (c) literally, “are clothed (with) scarlet”. This material was probably made of high quality wool. Genesis 41:41-42 (IEB): “So Pharaoh said to Joseph, ‘Now I am putting you in charge of the entire land of Egypt (Joseph was about to become Prime Minister (Grand Vizier) = the second in command of the Egyptian Empire). Then Pharaoh took off the special ring (“the signet ring”; that is, the royal ring used for giving an official seal to government documents) from his finger and put it on Joseph’s finger. Pharaoh had his servants dress Joseph with linen robes, and he put a golden chain around Joseph’s neck. In the verses about the worthy woman, she has provided the best quality materials, made by her own hand. But I see from Proverbs 7:16 and Mark 15:17,20 that these same materials can be used for evil, so it is not the material itself that is making her worthy, it’s her effort to provide only the best for her household. The world would tell me that more is better. But God’s word tells me it is giving my best effort that is of value to Him. I leave my study today focused on that. “Respect” as; “(1) To feel or show deferential regard for; esteem. (2) The state of being regarded with honor or esteem. “Civic” is defined as; “Of, relating to, or belonging to a city, a citizen, or citizenship, municipal or civil”. Clearly a worthy woman is not some hothouse flower. She is wise to the world. She deals with the deceitful traders, selling quality goods, and as Proverbs 31:18 says; “She makes sure that she makes a good profit”. She is in the world but not of the world. Her husband is respected. This says something about the type of man she marries, but is also a statement of his good judgment in choosing a worthy woman as a wife in the first place. I leave my study today with greater admiration for the worthy woman. This world needs more women like her; I need to be more like her. Proverbs 31:25 (IEB): “She is clothed with strength and honor. She looks forward to the future with confidence.” (Literally, “And she laughs at the day to come.” She is not worried about her family getting cold or looking shabby). 1 Timothy 5 (IEB): Paul is writing to Timothy about supporting the widows. 5:5, “A widow who is truly a widow – the one who is all alone – has put her hope in God.” 5:9. Paul says “Don’t put a widow on the list for help if she is under 60.” She must have been faithful to their husbands, raised their children, done good deeds, etc. In other words, she has to have been a worthy woman. 5:11 “Don’t put the young widows on the list, because after their sexual desires become strong again, they want to marry non-Christians and leave Christ.” They reject their first faith and become lazy, gossips and meddlers. Clearly the worthy woman can look to both the immediate future and her retirement with confidence. I leave my study today with this thought; As I get older (and slower) I still have an important roll to play. I just saw a post on Facebook the other day saying; “Sometimes I open my mouth and my mother comes out”. It’s something to think about – To a worthy woman’s daughter, this is a blessing. My prayer today is that I will think before I speak and what I say and do will always glorify God. This world pulls our children in all the wrong directions. From TV, Movies, Social Media, and even school, our children are being inundated with a worldly message. If we as parents and even grandparents are not restricting that influence where we can, investing our time, and teaching what God’s word says at every opportunity, we will loose them to the world. The worthy woman watches over the affairs of her family. She is “that” mom. The one that insists her children attend church, who practices at home what the Bible says. She’s the one, who teaches her children to respect authority; who restricts access to “worldly” influences. She’s the one who sees that they are dressed modestly, and know how to behave in public. Who participates in what is going on at school; who supervises her children and knows where they are and who they are with, and teaches them the value of obedience, modesty, purity, and serving others, and that respect is earned. I don’t know a mother alive today who wouldn’t want her children to show that they respect her. I can’t imagine a wife anywhere whose heart would not swell upon hearing from her husband that he thinks she is the most excellent wife. I leave my study today with a renewed focus on what is important to God; my obedience. The world would have me lust after the “things” of the world, but doing that takes my time and focus from Him. God expects my every action to glorify Him. He wants me to do my best, and in doing so I will be rewarded with the respect of my children, and the praise of my husband in this world. My actions will be pleasing to God. Ecclesiastes 1:2, “The Professor says: Meaningless! Meaningless! Utterly without meaning! Everything is without meaning.” The footnotes for this verse indicate this is the word hebel again or “breath”, the meaning of the name Able in Genesis 4:2 whose transitory life was cut short by Cain. Job 14:1-2 (IEB): All of us were born to women. We live only a few days and we have lots of trouble. We grow up like flowers, and then we dry up. We are like a passing shadow that does not last. The world tells us that a woman is beautiful if she looks young, is thin, and wears expensive things. She expects everything to be given to her for just existing because “she deserves it.” Material possessions and prestige are her goals. The worthy woman puts service above self. Her beauty comes from her reverence for God, and obedience to His word, including putting herself under her husband’s authority. Her beauty can be seen in the personality of the heart, and in her gentle and quiet spirit. Her goal is to please God. In doing so she also pleases her husband. Her husband should praise her openly! She is a precious gift from God.